" You seek a false comfort when you demand that I define myself for you with words. Words do not contain or define any person. A heart can, if it is willing. " Patience is of a fairly average build, maybe with a little extra padding around her bones, but not enough to be especially remarkable. Her face is rather long and oval-shaped, with a soft chin and a long, straight nose. Her lips aren’t particularly full, though they are rather darkly-colored by nature. Her skin is on the pale side, rarely able to tan at all. Her eyes are wide and dark brown, giving her a rather innocent look. Her hair is medium-light brown and extremely curly, occasionally tied back but often falling in messy ringlets from whatever style she’s attempted to confine it to; it tends to lighten when she’s been in the sun often, leading her ends to approach blonde. She's missing her left hand, but it doesn't seem to have slowed her down any at all. She doesn’t seem to have any fashion sense whatsoever, and wears whatever she happens to like that day, whether or not it makes sense. She often wears things Turns out of fashion, or wears clothing made mostly of gauzy lace and linen in the middle of winter with no apparent regard for weather conditions. She has a habit of attempting new paints on her face, leading to some interesting patterns and colors on some days, and she bears two small lines, one thicker than the other, tattooed onto the inside of her left ankle, where she was experimenting with tattooing one afternoon. Her fingers are often stained various colors with the inks she’s been making and using, and occasionally the accidental coloring spreads to other parts of exposed skin. Patience has never really matched her name. She’s capricious, rarely sticking to one thing for very long at all, and constantly changes her mind about what she is and isn’t interested in. As a result, she’s amassed small bits of information from just about every possible area of learning, but she’s far from an expert on just about all of them. Really, the only things she keeps going back to is paper-making, which she believes will help pass on knowledge to future generations, and herb-lore, though she primarily focuses on those plants which could be used to make inks. She has, on occasion, attempted to cook with some of the plants, but her cooking should be avoided at all costs: she’s more likely to burn the place down than make something edible, and that’s assuming she doesn’t accidentally use something poisonous (though for the most part she has the poisonous plants memorized). She cares for those around her, though sometimes without seeming to. She’ll call people by whatever name she feels like, no matter how many times they correct her, and she’ll send people on seemingly pointless errands, and she would do just about anything to see the people she loves safe. Despite her apparent obliviousness to what’s going on around her, she can be surprisingly competent and has a good head for politics, though she prefers to stay as out of the spotlight as possible. She’s not a recluse, but her abrupt mannerisms can be off-putting, and as such she tends to spend a lot of her time alone with Chivalry and Patisk. She gets personally offended when people misgender Patisk, which is often, and never hesitates to tell people off when they’ve done something she doesn’t like. She gives lectures often, and attempts to teach people the things she knows, often without success as she can rarely concentrate on giving a lesson for more than a few minutes before growing frustrated at her student’s failures to meet her unreasonable expectations. Patience was not the easiest child to deal with. She was stubborn and demanding, wanting things to be explained to her in full and getting irritated when they couldn’t be. She hated mysteries, and made it a point to ensure that there were as few unsolved ones in her life as could be. She was, however, largely a happy child. She would play with the cook’s children, and learned many things about herbs and other plants: which ones could be eaten, which ones were good for a stomachache, and which ones to avoid at all costs. She was not, however, especially interested in learning to cook with those plants, and was far more engrossed in finding other purposes for them. Her favorite was discovering that pepper seeds, ground up and mixed with some other things to mask the scent, made a marvelous sneezing powder. She grew up curious and strange, never making many close friends but seeming perfectly content with that. Her friendships were spur of the moment things, formed with whoever happened to share her interests at that time, and largely set aside once she changed her mind about what she wanted to do, though never forgotten. Her parents sometimes despaired of her carefree nature: she was supposed to be a Lady, and how could she be one when she never acted like it? But Patience had no interest in being a Lady. Oh, she’d be one, if that was what she was to be, but that didn’t mean she had to act it. If her parents’ designs succeeded and she became one by marriage, then that relation alone would be enough to grant her the title, and none of her mannerisms would change that. Her parents were not amused by that logic. However, their plans were foiled by a man named Chivalry. In her twenty-first Turn, Patience fell for him when he not only complimented her on her the smell of the tea she was brewing, but drank it without spitting it out; most people's reaction to things she made ranged from disgusted to horrified. Things proceeded after that; she gifted him a plant cutting to show her appreciation and affection. When that went over well, or at least not terribly, she continued giving him plants, and occasionally small decorative drawings done with the ink she’d made from those plants. Chivalry, in turn, used those plants and others he’d acquired, to make her a garden where he finally proposed a more formal union between them. Patience was delighted to accept… but only after pointing out that the flower he’d stuck in his mouth in some attempt to look like a hero in a story was, in fact, poisonous. He spent their honeymoon sick, and she took the opportunity to attempt to teach him which plants were poisonous and to stay far, far away from. She feared he didn’t particularly remember most of it afterward. Eventually, Patience grew interested in whers, as she had many other things before, and was more than eager to observe a hatching of those as well. When one of the Hold’s whers finally clutched, she presented herself as a hopeful—not expecting to be given one—and perched herself up on a chair, skirts gathered about herself while she attempted to sketch the first wherlets to hatch. However, the gold who had laid the clutch had other designs, and foisted a tiny egg off on her. Your problem now, she told Patience with some amusement as the egg jumped and cracked, finally breaking and getting goop all over her sketchbook. She might have been annoyed, had it not been for the little pink, blue-lined face that looked up at her from her lap. How could she refuse such a cute little girl? Not a girl, the strange-colored wher corrected her, biting at her palm and thus cementing the bond. Shortly thereafter, Patience ran to show Chivalry the tiny wherlet; he commented that he was fairly sure she (‘he’, she had to correct him) was actually a pony. Several Turns later, Chivalry got a letter from their nephew Fitz: he was to stand at his first Hatching at Igen! 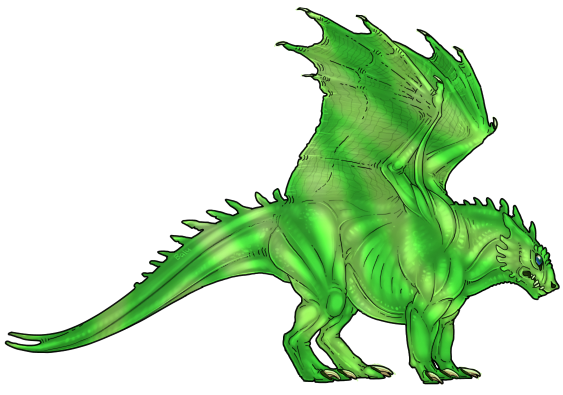 Though they’d only seen the boy once before, they decided that a visit would be nice, and that they would travel to Fort Weyr and from there get a ride from a dragon to Igen. They set off one bright morning with plenty of supplies and a map. Patience, who had spent the past week learning about navigation, was delighted to be in charge of finding their way to the Weyr. However, she quickly grew to believe that the map they’d been sold was inaccurate; things were not quite where she expected them to be. Mountain ranges marked to the south seemed to be far wider than they should have been, and they were in fact to the west. Chivalry, who had far more patience than Patience herself did, was kind enough not to point out that she’d not only turned the map sideways but was heading in a completely different direction than intended. They’d get to civilization of some sort eventually, once she got bored of navigating and he could get them back on the correct course. However, to everyone’s surprise (especially Patisk, who had been complaining for ages that they had no clue where they were going and were likely to die in the wilderness, and additionally that traveling during the day was folly), after a much longer journey than expected, they did, in fact, make it to the Weyr. The only problem was, it wasn’t Fort Weyr at all, but High Reaches. Somehow, between Patience’s terrible navigation and Chivalry’s attempts at righting their course, they’d managed to make it to an entirely different Weyr. Luckily, they were permitted to rest there a while before they could be sent back on their way to Fort Weyr. During that time, there was a Hatching, and Chivalry accidentally Impressed to a rather gorgeous-looking bronze. That apparently settled things for good; letters were sent to their families to assure them of their safety, and they prepared to have a life at the Weyr. Patisk sires a gold clutch, to Patience's extreme surprise. A splinter Patience got from a stick when she tripped and used her hands to break her fall gets infected, and the infection doesn't seem to stop. Her left hand is amputated to save the rest of her. Patisk falls into a trap someone clearly laid for wherries, becoming lodged on the spikes below and worsening his injuries when he panics. He has several deep punctures and lacerations, and a more serious one to his right hindquarter that will leave him with a serious limp. Patience's legs are badly scraped up when she jumps down to try to calm him, some of which later become infected, and her left ankle is sprained. 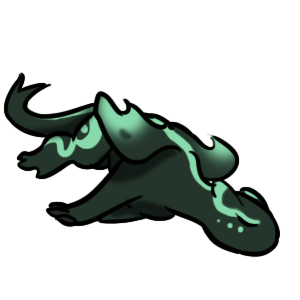 Patisk is one of the daintiest, prettiest little whers to have hatched. He’s small, and rather less muscular than a lot of whers, though he still lacks height. His build is more like that of a small pony than anything. His coloration is varied, a mottled hide of pinks, purples, and oranges with a shine that approaches that of some of the metallic dragons. He has some pale blue markings on the ridges around his face. For the most part, he’s one of the girliest-looking whers one could ever imagine… but he’s not a girl. The only thing that really makes it very clear that Patisk is, indeed, a he is his voice: it’s deep and resonant, definitely in the lower bass ranges. Patience has occasionally commented that it’s the sort of voice that might lull one to sleep, if he so chose to use it that way. He does not. Patisk is very, very quick to inform new people that he is not a girl. Even if he’s the girliest of colors, and tiny and dainty like a pretty little pony (he hates that Chivalry came up with such a ridiculous comparison for him, and continues to bear a grudge Turns later), he is not a girl. Of course, one only has to spend a few minutes with Patisk to realize that he is not, in fact, girly in the slightest. He’s gruff and brash, prone to outbursts of temper and feels a strong need to show off in front of female whers. He’s extremely set in his ways, and doesn’t like new ideas. Usurth is a bit of an outsider, and still not considered trustworthy; otherwise, the only ones he really cares about are his ‘family’, Patience and Chivalry. Verity does not count. At all. He barely tolerates the presence of fire lizards, and has been known to snap at them if they get too close. However, he’s actually pretty fond of other small pets, so long as they aren’t fire lizards. He somewhat resents the existence of garnets, if only because he’s frequently mistaken for one now. Bright, brighter, brightest! Patiesk is long and short, well, shorter than her length says she should be. She's bigger than whites but not the biggest green. She still stands out without hesitation! She is a bright, vibrant, hard to miss green all over with bright stripes of a springy green that looks like some eager child painted over her with a sponge. It will be hard to see her in the undergrowth, she may disappear if someone does not keep a good eye on her! Patiesk has a high pitched and friendly feminine voice. How cheery! Patiesk is a big ball of bright, cheerful attitude from head to tail. She is a bouncy thing, always on the move and investigating everything she can find. She is bold and almost brash, always having to know or to do something first hand. She is incredibly bright, picking things up with ease and running with them. She is very confident when it comes to most things, and she's most proud of the love between her and her rider - but that love extends to everyone. She loves making friends and goes out of her way to find things that she shares in common with others so she can befriend them. She is almost too friendly, but its almost always in a positive light; she respects people too much to bother them or invade their space. She's an extremely supportive partner to those in her life, doing everything to assist and help she can. Her sense of curiosity is insatiable - she must simply KNOW! She's also incredibly empathetic, inherently knowing how to read people and acting in accordance to what she gleans.